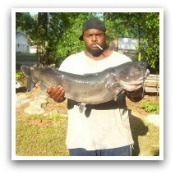 Ready to have some freshwater fishing fun with using catfish lures? Many fishermen are unaware of people catching catfish on artificial baits. Or might have heard about it happening. Never the less, it doesn't seem to be talked about much. Fishing for catfish with lures is not very common at all. It's definitely not the traditional technique used for catching these whiskerfish. The odds are much higher in your favor to use stinky dead baits to attract these bottom dwellers... yes, these are the best baits for catfish. Because catfish often reside in dark and dingy muddy waters, they are forced to seek out food mainly with their keen sense of smell. They can sniff out live and dead stinky bait from far off distances to find a delightful meal to eat. Anglers have caught catfish on fishing lures more than what seems to be reported. The majority of the time it's by complete accident. Surprised anglers have found them on the other end of their line when fishing for largemouth bass, striped bass, crappie, trout and all kinds of other freshwater fish. Some people have been known to specifically focus their catfishing trips by targeting them with lures. When the conditions are right, catfish can be caught with lures. The water clarity should be at least somewhat clear. And if the catfish are hungry enough, they will come after your presentations. The best times seem to be from pre-spawn to post-spawn, as they will be more actively feeding, before it gets too warm. They have the ability to sense vibrations, like the vibrations of a lure which simulates an injured or dying bait fish. They'll follow those senses and attack the lure when they see it. I would also suggest covering you lures with some good smelly fish scent. There've been numerous reports of catfish caught on all sorts of freshwater fishing lures. I've heard of people catching them on inline spinners, spinner baits, crankbaits, swimbaits, jigs, spoons, top water plugs and soft plastics. One fisherman even noted catching a bunch of channel catfish while trolling one day, all ranging in the one to two pound range. The different species of catfish that have been know to hit on lures are flathead catfish, blue catfish, wels catfish, bullheads and channel catfish. I'm sure there are more, but these seem to be the most common species for snacking on artificial fishing lures. Are you ready to get in on the exciting action of catching whiskerfish with some cool fishing lures for catfish? There are companies that actually design and produce fishing lures specifically for catfish. These aren't the kind that you would necessarily cast out and crank in all day long. There are various dough baits and dip baits to choose from. Many come with a treble hook inserted through a small sponge. Others have bait tubes to resemble worms. Usually, these are designed so that you can either dip them in a sauce, pack them with a smelly dough or paste, or all of the above if you wish to. One of my favorite catfish lures is the Tear Drop plastic lure made by Uncle Josh. Check out the Tear Drop Catfish Lures here. I also love the Strike King Catfish Huckleberry baits. You can inject the lure with a stinky scented dough ball into the chamber. It won't fall out so there's no need to keep reloading. Or you can just dip or soak them in a smelly dipping sauce. Dip worm baits and other stink bait holders are just as effective with the right type of dips or doughs. Some of the most popular attractive smelling flavors of scented dipping sauces are blood, shad, and cheese. Catfish love these tasty scents.